· Short Equal Length Primaries. The shortest possible length primaries you can have on an Equal Length header. Short means less header volume and quick spool up. · Symmetrical Primary Design. All primaries have a similar tube length AND bend geometry. This keeps the pulse velocities high and consistent compared to equal length headers with different (non-symmetrical) primary tubing geometry. · Smooth Mandrel Bends. All of the bends utilize a mandrel for smooth non-restrictive flow. Not only that, we use the largest bends possible at every location. It would be cheaper to use 2” bends everywhere, like others do, but that’s not going to give the best performance. · Thick Walled 321 Stainless Steel Construction for Long Life. 321 is alloyed with titanium, costs more, a lot more, but it’s the ideal material for high temperature turbocharged applications. Would 304 stainless work, yes, but the temperatures on our turbocharged cars can exceed the limits of 304 stainless enough to make them brittle and crack. 321 stainless steel has higher strength and toughness at elevated temperatures. It was developed by the aircraft industry specifically to address 304 stainless manifolds that were cracking. 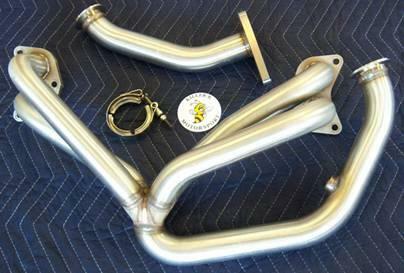 Killer B Motorsport is the only company that manufactures full 321 headers. · High Heat Retention. 321 stainless steel conducts less heat than 304 stainless steel. The short primaries and properly sized secondaries also pull less heat from the exhaust gasses increasing turbine efficiency. 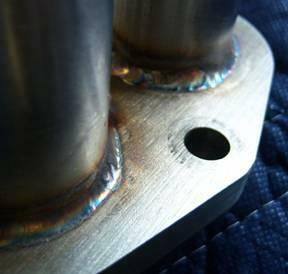 Large tubing headers expose the exhaust gasses to more surface area transmitting more heat and reducing exhaust energy. You can also ceramic coat or wrap our headers (and keep the warranty) without exceeding the temperature range like you can with 304 stainless. · V-Band Up-Pipe Connection. Why V-Band? Fast, easy, no gasket, no leaks, perfectly concentric alignment of tubes for no disruption of flow, what’s not to like! · Up-Pipe included. Of course it comes with an Up-Pipe! This header was designed as a complete system. Using other up-pipes would only compromise performance, and nobody wants that. · Works with OEM EJ25 Oil Pans, and Killer B Motorsport Performance Aluminum Oil Pan! · Made in the USA and Killer B quality!